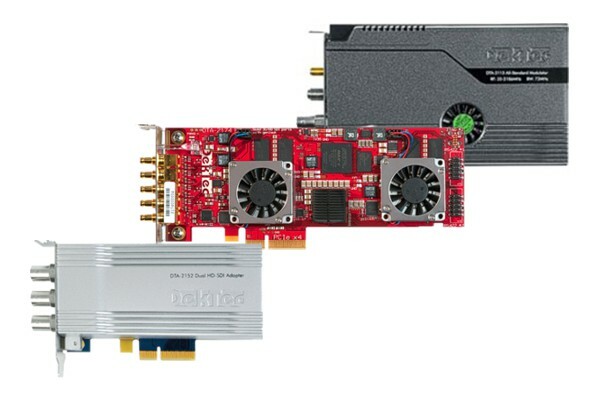 DekTec's extensive portfolio of PCI Express cards provides key I/O and processing functions for digital TV signals carried on any medium: IP, ASI, SDI or RF modulated. These cards are ideal building blocks in many kinds of PC-based DTV solutions. The scope of applications you can build is only limited by your imagination! The table below is sorted on type number and shows all DekTec PCI Express cards. For a list of just modulators (PCIe and USB) please refer to the Modulators section. Satellite modulator with support for DVB-S, DVB-S2, ISDB-S, DAB and arbitrary I/Q samples. AWGN insertion is available as an option. Attractively priced cable and terrestrial modulator for various OFDM and QAM standards. Well suited for OEM integration. General-purpose high-end cable, terrestrial and satellite modulator. Programmable output level from -60 to 0dBm. Very low phase noise. Eight-channel firmware option available (8x 8MHz in VHF/UHF). Software Defined Radio (SDR) receiver with several software demodulators available. Advanced features and measurement capabilities exceeding those of consumer demodulator chips. Dual QAM receiver for J.83 annex A (DVB-C), B and C. The received transport stream is available on PCIe and on two ASI monitoring ports. DVB-S/S2 receiver that can be configured as single-channel receiver with support up to 32-APSK, or as dual-channel receiver for QPSK and 8-PSK. VHF/UHF receiver for DVB-T/T2, DVB-C/C2 and ISDB-T. Supports T2 Lite (DVB-T2 v1.3.1). Hardware-based demodulation with 0% CPU load. Twelve (!) receivers on a single board, supporting any mix of cable (DVB-C, QAM-B/C) and terrestrial (DVB-T, DVB-T2, ISDB-T) signals. Parallel port for receiving or transmitting 8-bit data with valid and sync at clock rates up to 108MHz. ASI port is lockable to 27MHz clock input. Four ports, independently programmable as ASI or SD-SDI, and as input or output. Building block for multiplexers, monitoring equipment, etc. Two ASI/SD-SDI ports, configurable as input+output with relay bypass, or as dual outputs. Two HD-SDI ports, software configurable as input or output and as ASI or SDI. Supported by DekTec Matrix API®. Universal Gigabit Ethernet port and three ASI ports, each independently programmable as input or output. Hardware support for zero-jitter IP playout and IP jitter measurement. Dual universal Gigabit Ethernet ports with hardware support for zero-jitter IP playout and IP jitter measurement. Support for SMPTE 2022-7 network redundancy. Four 3G-SDI ports, configurable in software as input or output, and as ASI or SDI port. Four ports together can be used to input or output 4Kp50/60. Supported by DekTec Matrix API®. General-purpose HD-SDI/ASI input and output, with relay bypass for creating high-availability. Supported by DekTec Matrix API®. Twelve independent HD-SDI/ASI ports, each configurable in software as input or output, and as ASI or SDI port. Supported by DekTec Matrix API®. H.264 HD encoder taking zero CPU cycles. HDMI input for compressing the PC's desktop and distributing it over IP. High-density encoding with two H.264 HD encoders on a compact PCIe card. 12G-SDI capturing and 12G-SDI output with HDMI 2.0 monitoring port.